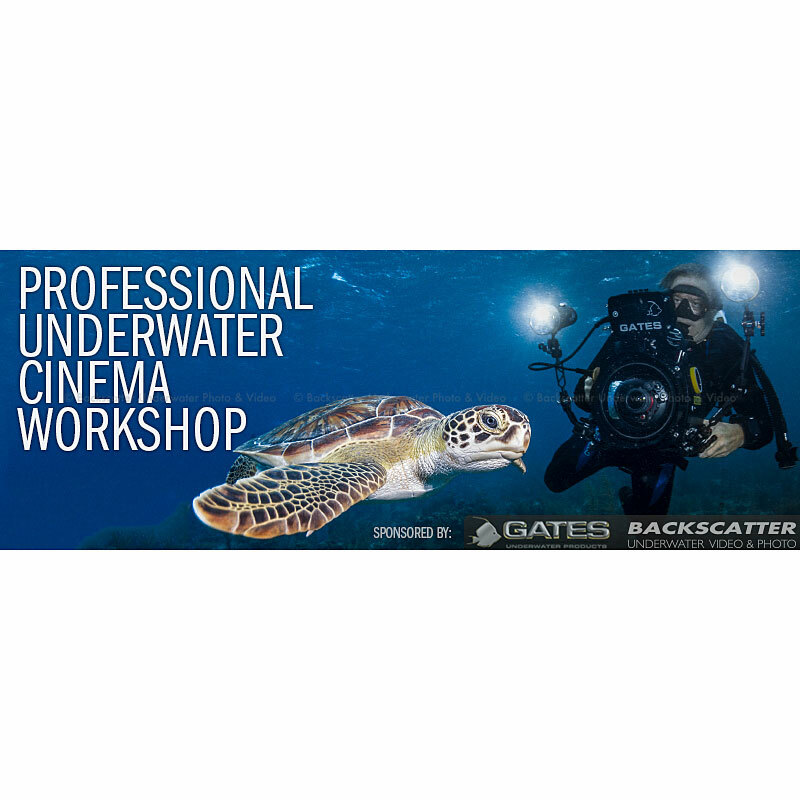 Backscatter and Gates Underwater Products are sponsoring a 3 day intensive workshop designed specifically for working professionals and new underwater cinema camera operators. We have combined the popular Gates STO Certification(Set-up, Test, Operate)with a real world shooting technique workshop crafted by the professionals at Backscatter. Class Is Currently Full. Please Call to be Added to the Waitlist. New professionals seeking a resume level certification in the safe set-up and operation of Gates housings. Working professionals seeking new insight onequipmentconfigurations, lens selection, and cutting edge techniques for underwater focus, exposure, color, static and dynamic camera movement for underwater imaging. Aspiring DSLR camera users looking to make the leap to a professional cinema system. We limit class sizes to 9 guests to maximize one-on-one opportunities with our many instructors. All participants will receive hours of time on professional cinema equipment on land and in the pool. Plan to spend a full day in a pool to apply the techniques you've learned in a real worldenvironment. Backscatter is very experienced with commercialfilmmakers discovering underwater for the first time and natural history filmmakers exploring a newangle on an elusive subject. Well help make this pool session fit your experience level. Non-certified divers (or rusty divers) are required to prearrange our dive instructor support option for an additional fee. Rental dive gear can be prearranged for poolside delivery for an additional fee. Classes at Backscatter not only give you cutting edge knowledge, but give you premier access to the worlds largest underwater photography showroom. There is no better opportunity to put your hands on the latest in underwatertechnology. If you can arrive early, meet us for a quick briefing at Backscatter on the workshop schedule and get to know the instructors and your classmates. After the briefing, some might move out for dinner and drinks. No worries if you cant arrive early, well catch you up to speed the next day. Session 1: Gates STO Certification session covering camera housing set-up, testing, operation, and the fundamentals of underwater optics. Session 2: Introduction to our favorite 3 camera configurations. Session 3: Intensive hands-on session to learn basic set-up and speed swapping between different camera configurations. Backscatter West is located across the street from the world renowned Breakwater dive site at San Carlos Beach. We can help you plan a guided dive on the Breakwater or a day boat run to our favorite sites in Carmel Bay or Point Lobos Reserve. Advanced notice is required. A 1985 graduate of Michigan Technological University (BSME, MBA), John gained extensive Product Management experience in defense, satellite, wireless and software industries. Learning to dive in 1991 he earned the PADI Master Instructor and HSA Instructor (Handicapped SCUBA Association) rating and trained hundreds of people to dive, including several disabled students. An avid diver, John started shooting underwater video in 1993 as a means to share the marine world with friends and family. He married his best friend, dive buddy and Divemaster Karen in 1996. Unable to keep his feet firmly planted on the ground John took up flying in 1997 and currently flies ultralight aircraft. While searching for his next DV underwater housing in 1997, John met Elwyn and Ann Gates, founders of Gates Underwater Products. Knowing he would eventually be a business owner, John established a relationship with the Gates providing part time marketing and field test services. Then in 2002 John and Karen acquired Gates, leaving corporate life behind. 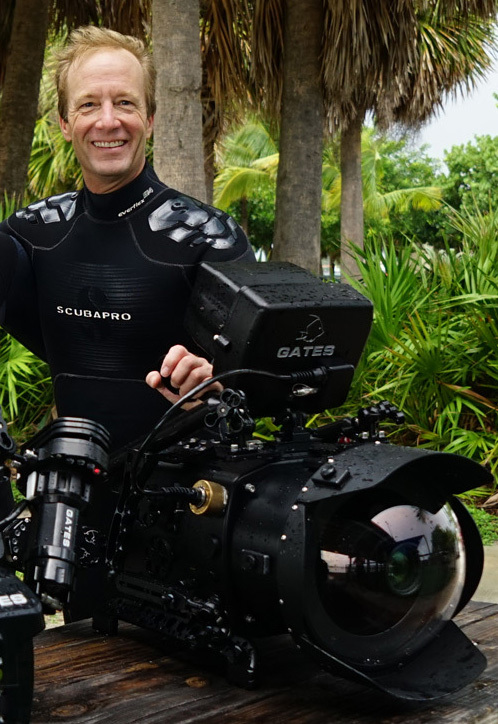 As President of Gates, John enjoys turning ideas into reality through the design, manufacture and use of all Gates products to produce ever better underwater motion images. He is distinguished as An engineer by education, executive by occupation, and marketeer by avocation. Matt Ferraro has been the lead cinematographer for the Cousteaus for the last 15 years. From the tannin brown waters of the Amazon to the crystal blue below Arctic ice, Matt has documented stunning wildlife behavior and the Cousteau team in every corner of the Earth. Matts camera experience is as diverse as his travels. Matt cut his teeth on 35mm motion picture film, progressed through all professional video formats and is an expert with the latest digital cinema cameras such as the 6K Red Dragon. Matts long list of credits includes the award winning 11 hour seven-episode PBS series Ocean Adventures and the record breaking Mission 31. As a deep tech and closed circuit rebreather diver, Matt documented the rarely visited wreck of the USS Monitor, was the part of the first team in 19 years to touch down on Cordell Bank and was one of the first to record the twilight reefs of the Northwester Hawaiian Islands. While continuing production work and his passion for ocean conservation, Matt is currently employing his hard won skills in a newly created position for him at Backscatter Underwater Video & Photo as Resident Cinematographer. Rons professional career began as a recording engineer in the mid-70s, working in studios in Chicago, Muscle Shoals, Dallas and Los Angeles. Moving away from music and commercial work to film post-production Ron became Operations Manager at Lucasfilm Skywalker Sound in Marin County, north of San Francisco. Ron founded Visioneering Design Company in 1992, specializing in creating post-production facilities for major studios and individual directors, producers and other executives. Rons clients include James Cameron, Jim Jannard - founder of Oakley and Red Digital Cinema, Jeffrey Katzenberg, DreamWorks Animation, JJ Abrams - Bad Robot, Lucasfilm, 20th Century Fox, Warner Bros, and many others. 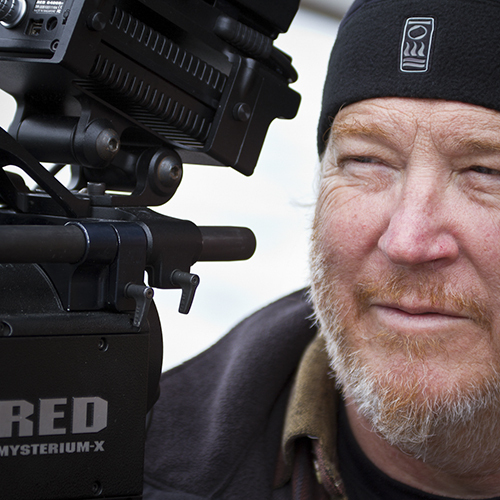 An avid diver and underwater photographer, Ron started shooting motion images beginning with Red One and subsequently acquiring one of the first Gates Deep Epic housings and Red Epic cameras in 2011. Rons credits include Director of Underwater Photography for Discoverys Shark Week, producing award winning short films shown in various film festivals, and is represented by Mammoth HD and Nature Footage for stock images. Rusty is the product manager at Backscatter and a freelance underwater and nature videographer based in Monterey, California. Rusty has extensive use with most of the current manufacturers video and still housings being offered in todays market. Rusty has been diving closed circuit rebreathers and underwater scooters for the last 10 years and entered the industry as a lead technical sales person with Light & Motion. 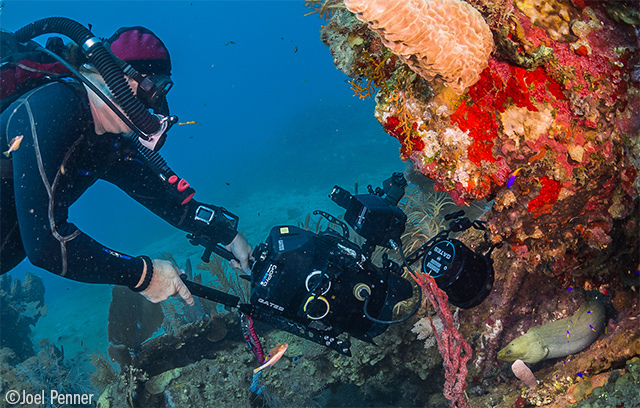 Rusty joined Backscatter as product manager where he constantly evaluates the latest camera technology and blends imaging techniques with the art of technical diving. Rusty is well known in the diving industry as a great educator and mentor of new photographers and technical divers and is always available for imaging and technical support. 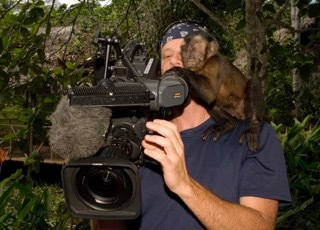 Russ's film credits include PBS expeditions to the Andrea Doria, CBC "The Nature of Things", DPTV "Shipwrecks of the Great Lakes", BBC "Life" series and "Million Dollar Otters", Local Television shows and several projects in the cenotes of Mexico and freshwater caves in Florida.